Samsung Galaxy Note 9 will be released on Thursday this week, and there are a lot of reports about its features and design. Its price will undoubtedly exceed 1,000 dollars. Its protective measures are essential, it can help you save a lot of money, and Wallet Phone Case is one of the best choices. This phone case we’re going to discuss today. 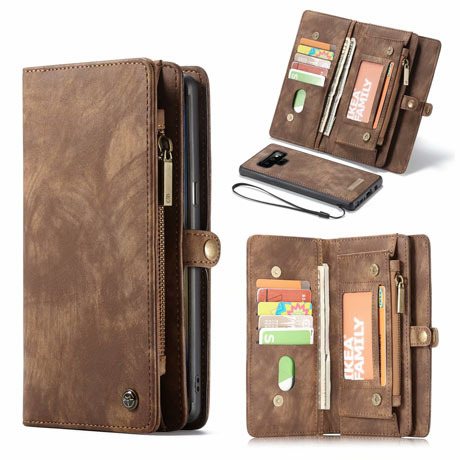 This Samsung Galaxy Note 9 case is made of PU leather with 11 credit card slots on the inside, 2 pockets for cash and receipts, and a magnetic and wrist strap. If you find CaseMe case to be bulky, you can remove the wallet part of the case and turn it into a standard flip cover such as an accessory, which is also very helpful. It can completely cover Samsung Note 9, providing 360 degree protection, not worrying about broken screens. Its design is very stylish, suitable for men and women. For only $22.99, it’s also very cost effective.